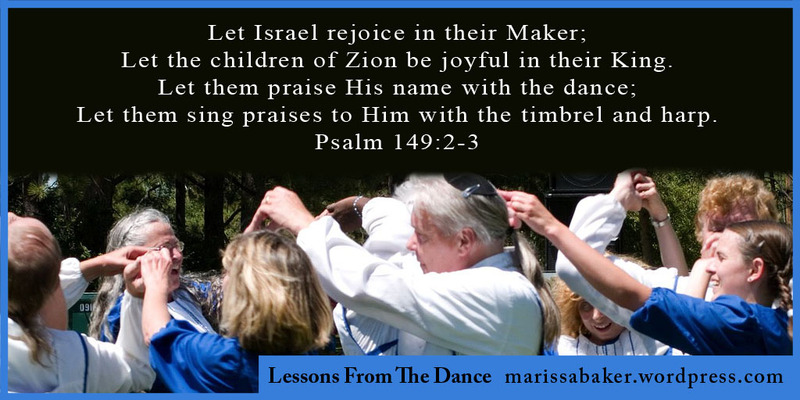 I joined a Messianic dance team early in 2015. My first introduction to the dance was about a year before that, when a dancer shared some basic lessons at a Feast of Unleavened Bread event in Michigan. I absolutely loved it, and I picked up the dances so quickly my mentors say that God has given me a gift for the dance (there’s really no other way to explain why I’m good at it — normally I’m rather clumsy). Dancing at church, especially to open the service, seems a bit odd to many Christian denominations. But there is Biblical precedent for dance as part of worship and I’ve found the inclusion of dance (and especially being involved in the dance) is a blessing I hadn’t expected. And it has taught me some valuable lessons about dancing in unity with God on a spiritual level. When you’re first learning to dance, you have to start with the basic steps. We don’t just expect new students to know how to do the Hallelu dance. First, we teach them how to do the mayim, tcherkessia, coupe, and 3-point turn that make up the Hallelu step combination. As they learn the basic steps, we start putting the steps together into patterns to match the different songs. And we keep going over and over those basic steps for the first couple months after new dancers join because they’re the basis for every dance we do. It’s much the same when we first begin our Christian journey. We start out learning about the foundations of repentance and faith. We learn that we should “love the Lord your God with all your heart, with all your soul, and with all your mind” and “love your neighbor as yourself.” Then we learn how to apply those truths in every day situations. As we grow, God deepens our understanding and adds more foundational principles like “the doctrine of baptisms, of laying on of hands, of resurrection of the dead, and of eternal judgment” (Heb. 6:1-3). Then we learn more about His expectations for those following Him, what grace truly means, how He wants us to view His commandments, and practical ways to follow Jesus with every step we take. But it all starts with the basics. Even if you know the basic dance steps, they’re not worth much until you set them to music. Music is so much a part of the dance that our dance leader often has trouble recollecting the steps of a dance when she’s trying to walk through and teach them slowly without music. As soon as the music plays, though, it all comes back to her. You can’t dance without listening to the music. A waltz calls for different steps than a tune in 4/4 time. In some songs, you need to wait for pauses in the music. For others, you have to be thinking two steps ahead because the music moves so fast. Often, listening to the lyrics tells you which part of the dance you’re supposed to be doing in multi-part dances. In the same way, we have to “tune” our Christian walks to the song God plays through His scriptures. While the Bible doesn’t use the dancing analogy much, it does talk about Jesus coming “to guide our feet into the way of peace” (Luke 1:78) and of God directing the steps of good men (Psalm 37:23, 31; 119:133). We have to study His words so we know the right steps and we need to listen for the guiding of His spirit for how to apply what we learn. Davidic dance isn’t a solo endeavor. We dance in circles of unity. Every dancer is responsible for knowing the steps to a given dance and how to follow the music. But there are some songs that just don’t stick in your mind as well and there are times (even when you’re no longer a beginner) that you just can’t remember what comes next. If you can’t remember a step, you can follow one of the other dancers. You’re already watching them to keep in unity, and you know you can count on them for reminders. In turn, they should know they can count on you to know what you’re doing for when they can’t remember a step. We help keep each other on track. Walking as Christians is made easier by fellowship with other believers. While God will certainly work with people who are isolated from other Christians, His intention is for the body of believers to come together and grow as we build each other up and learn to use our gifts (1 Cor. 12:1-31). We’re on this walk of faith together and we have the opportunity to help each other find the right steps to stay in unity with God. I did quite a lot of Davidic dancing back in the 90s but since moving away from Tennessee, have not found a group relatively close enough to get to do it much. It’s an awesome way to praise God.